The story of Knoxville's colonial history is told through several area attractions. 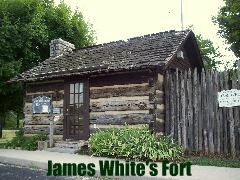 Perhaps none make history come alive as much as James White's Fort near downtown Knoxville. It was here that part of the city's origins began. In the late 1700s the area was wilderness. The area wasn't known as Knoxville or even Tennessee. Back then it was called the Southwest Territory, south of the river Ohio. What was originally started as a home for the family of James White became much more than simple buildings surrounded by a fence. Name changes for Tennessee and other the other states surrounding it would come years later. As Knoxville developed James White’s Fort became a hub for trade and services.